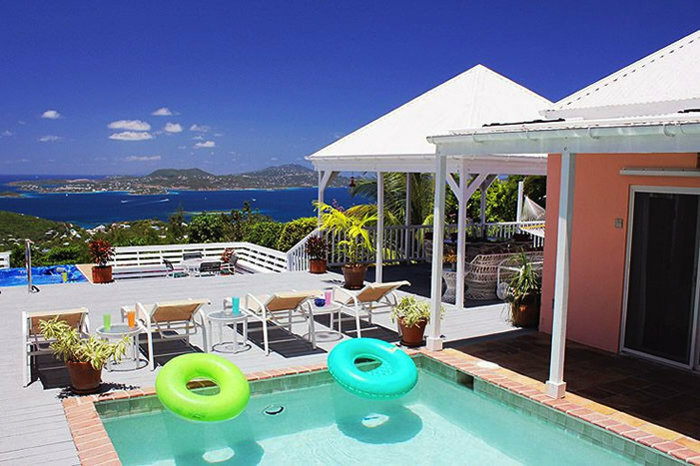 Coconuts and Plumeria are two sister villas, located atop Gifft Hill, St. John, with spectacular ocean and sunset views. 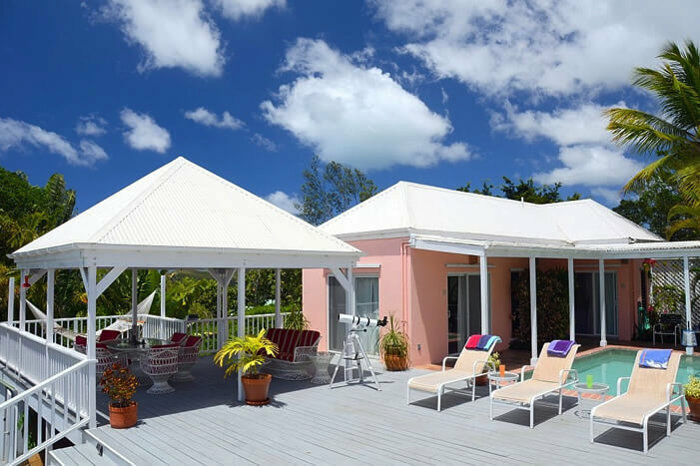 Each villa has three bedrooms and three baths, with AC in all of the bedrooms, a heated pool and spa, expansive decks, and both an indoor and an outdoor kitchen. 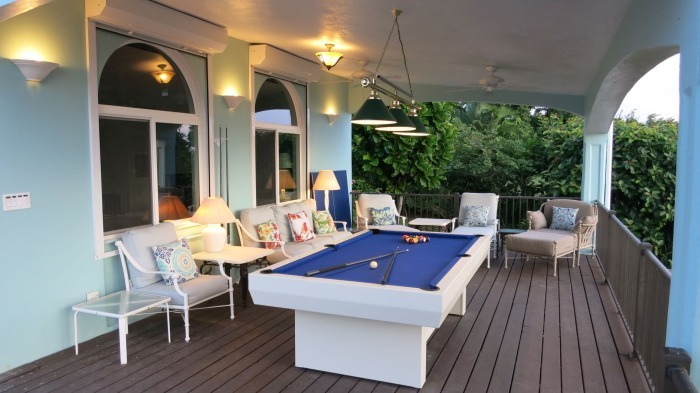 Coconuts and Plumeria each feature a spacious billiard and table tennis view porch, as well as a 100" front projection system with an extensive Blu-ray library. Coconuts sleeps up to seven guests; Plumeria, up to eight. 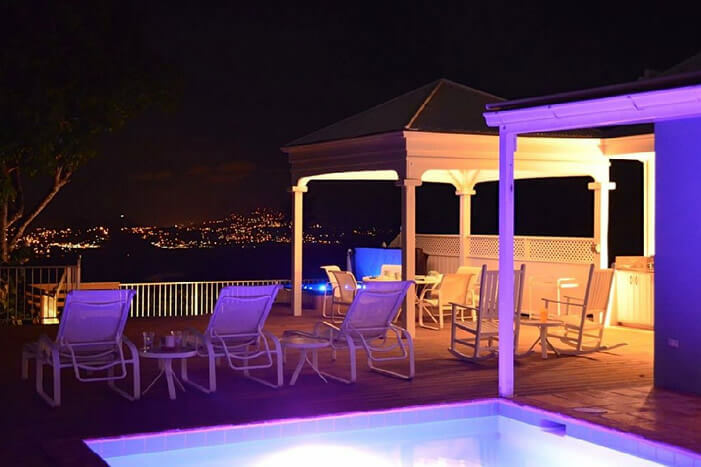 Their flat, hilltop locations provide complete privacy, with the architectural layout of both villas providing the finest in Caribbean indoor-outdoor living. Coconuts and Plumeria are entirely separate villas, each on their own spacious lot, with lush tropical landscaping on and between their grounds, and no shared driveway or amenities. Any damage from Hurricane Irma was fully repaired in the first half of 2018. Ten ball in Thatch Cay! 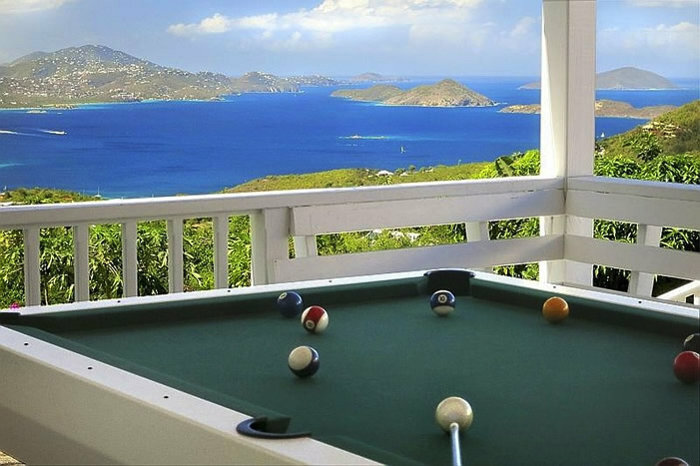 Billiard porch with full sized, single-piece slate pool table with electric-blue felt, spectacular ocean views, and a table tennis top. Well-equipped gourmet indoor kitchen, with an ice maker, high end coffee gear and beans, a full set of Penzeys' spices, crockpot, food processor, etc. Our altitude of 750 feet not only provides amazing ocean vistas, but also temperatures that are a refreshing 4°F cooler than down at sea level. High speed 20 Mbps internet, with villa-wide wi-fi. Dual internet providers with automatic switching assures 100% uptime. Coconuts and Plumeria can be rented together, accommodating groups of up to fifteen. 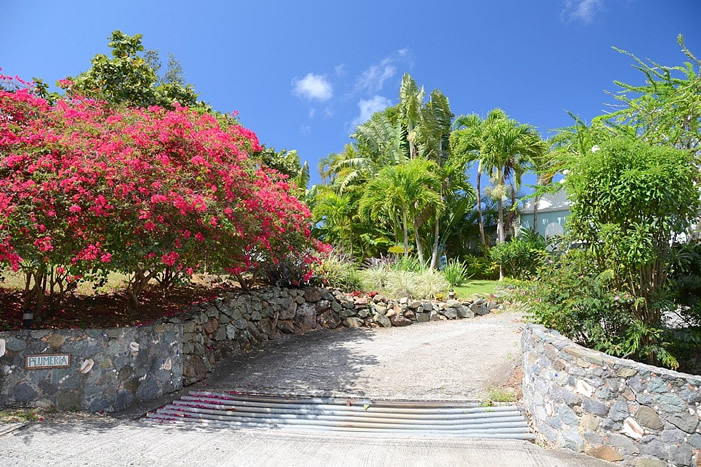 A gate between the properties is unlocked for joint villa rentals, allowing guests to walk freely between their lushly landscaped grounds. Exceptional villa documentation and labeling, and ample electrical outlets for all of your devices. Coconuts and Plumeria each have a nearly identical architectural layout: Four buildings (indoor kitchen, great room, guest bedroom, and master bedroom), arranged in a "U" around an interior courtyard and pool, with decks, outdoor kitchen, billiard porch, gazebo, and spa facing spectacular views to the west. 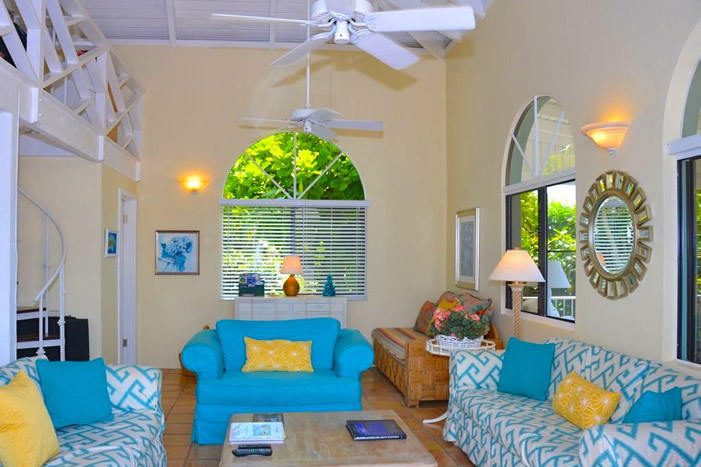 The primary difference between the villas is that at Coconuts, the indoor kitchen is a free-standing structure with a breakfast bar and motorized screen. At Plumeria, the kitchen and the great room have been joined together. Low and High Season surcharge for additional guests: $35 per person per night. This surcharge addresses the additional costs for laundering, housecleaning, and electricity/water use (very expensive on St. John) that scale with head count. The above rates are based on a stay of at least seven nights. We can accommodate shorter stays; if your shorter stay is bounded on each end by occupied days, there is no short stay surcharge. If there are available dates before and/or after your shorter stay, we assess a surcharge of 10% over the nightly rate for every day less than seven. For example, a six day stay would have a 10% premium, a five day stay would be 20%, etc. To reserve your stay at Coconuts or Plumeria, you can either book through VRBO (Villa Rental By Owner), or book directly with us. 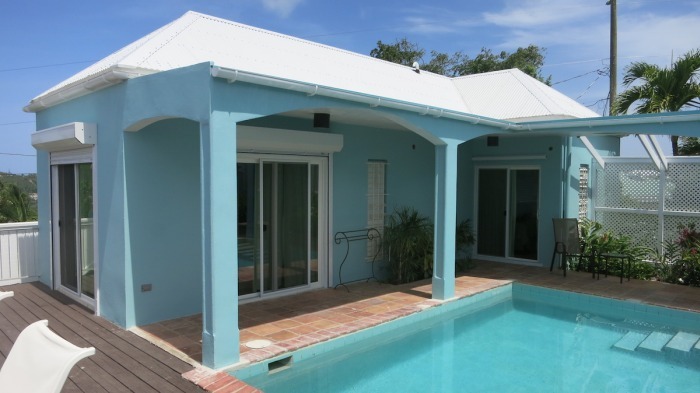 Links to book either villa through VRBO follow, along with a reservation request form for direct bookings. Please note that our villas are popular, and you may need to plan well in advance in order to secure your preferred dates. Coconuts and Plumeria have open access to the pool from any room, and accordingly present an inappropriate safety risk for toddlers. Infants, as well as older children capable of holding their own in a 51" deep pool, are welcome. By booking directly with us, you will avoid the VRBO service fee. We accept personal checks via the mail, as well as credit card payments thru PayPal (with a 3% surcharge to cover PayPal fees). Use the form below to request a quote for your desired dates. Please confirm that the dates you select are available per the above availability calendars, which are continuously updated and accurate. There is a 3% surcharge for payments via PayPal. For all reservation requests, please download and accept our Hurricane Policy and our Terms and Conditions (PDF). VRBO charges a sliding scale service fee, which is usually about 5.5%. However, they can serve as a trusted financial intermediary, processing your deposit and balance payments. VRBO accepts both credit cards and eCheck payment methods. VRBO's rate scheduler does not support the variable short stay premium described in our Rates section above, but this policy is described in our VRBO House Rules, which you will be required to review. Coconuts and Plumeria are exceptionally well documented villas. For a copy of our "Welcome to Coconuts" and "Welcome to Plumeria" documents, as well as our St. John Trip Planning guide, contact us at k+d@cocoplum.vi. The "CocoPlum Cam" is located near the boundary between Coconuts and Plumeria, and provides a great live view out over Pillsbury Sound. Click on the "Play" icon to start live video. Moving your cursor over the video feed will show controls to pause the video, or expand it to full screen. To return to the web page, simply hit the "Escape key", or click on the "Toggle full screen" icon. 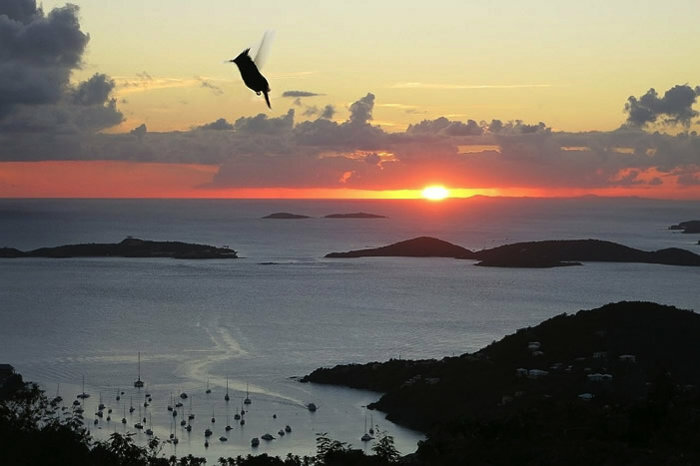 Our villas are located on the highest westward facing ridge on St. John, and provide spectacular sunset views. Be sure to check back around sunset time, or to catch your ferry in transit! Below are a few of our uniformly positive reviews; you can read lots more at our VRBO pages for Coconuts and Plumeria. 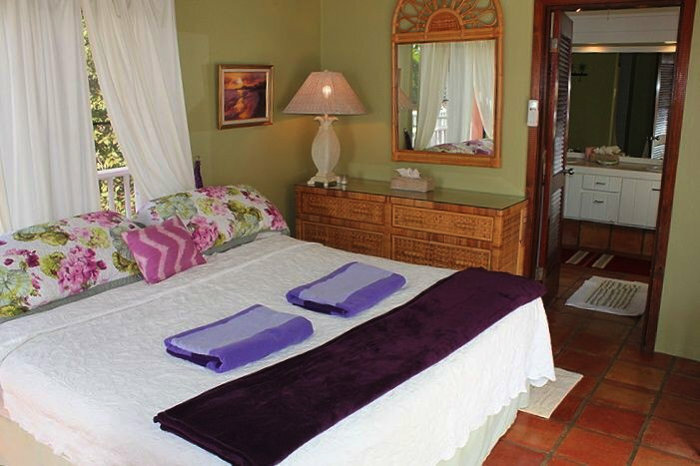 "My family and I recently stayed at Coconuts and it was absolutely perfect. The view is so spectacular pictures do not do it justice at all. 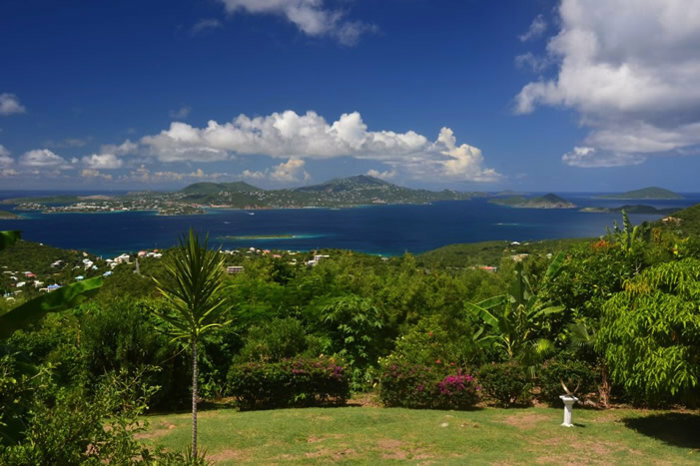 We have stayed on many Carribbean islands, but this view out did them all. The pool was great and the temperature for hot August nights wes perfect. We cooked and ate every breakfast and many dinners in the outdoor kitchen. The beds were comfortable and the airconditioning worked great. Water pressure was low but that was to be expected. All in all a great experience. We hope to return soon, but, however I just checked the dates we were interested in and they are already booked! All in all a great place and I highly recommend it!" "We had a wonderful time at Coconuts. 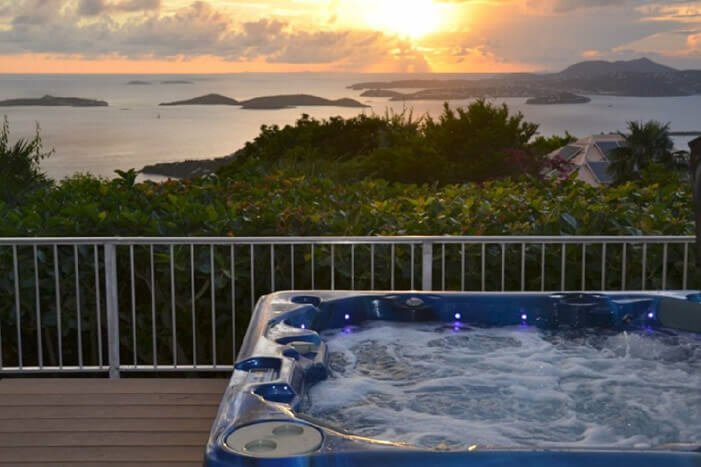 It was our first visit to St. John and we were out exploring the island daily but made sure we were back on time to enjoy the villa. We loved it so much we ended up just staying in for a day before we left. My boys were never bored in Coconuts, there was so much for them to do that I could just appreciate the spectacular view with a book and relax. We had all kinds of fun animals visit us too: hummingbirds, sugarquits, elk, cats, even two iguanas. The owners are a pleasure to work with, and Coconuts is a little piece of paradise. One of the best vacation villas we have stayed at. Don't hesitate to book it." "We just got back from a two week stay at Coconuts. The house is just as depicted in the picture and the owners (Kevin and Danielle) was a pleasure to deal with. We had one minor issue with the house and they immediately answered and tried to solve it. I also left a couple of items there and they were so helpful with finding someone to ship those to me. 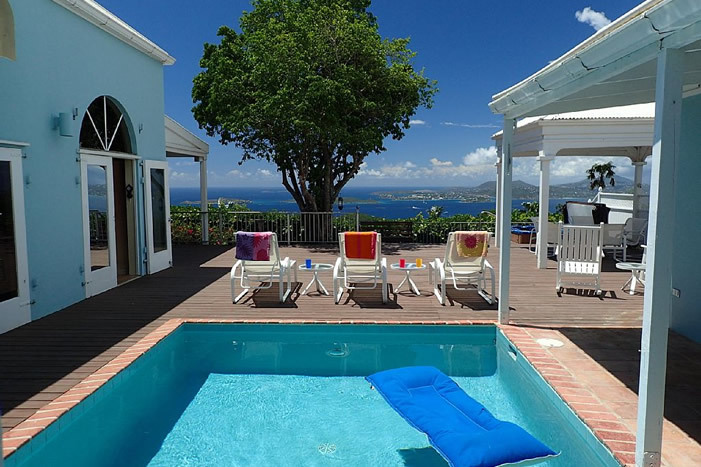 We were so completely satisfied with both St. John and Coconuts that we already booked the villa for next year! The house itself is in a great location.. about 10 minutes from town and 20 minutes from the beaches. The hills were something to get used to, but after a couple of days it was no big deal. The view is amazing... it has become my happy place and I can picture it in my mind at any time. We loved the big covered gazebo and the outdoor kitchen. House is very private even though you are in a residential area. The teppanyaki was something new for us, but we loved cooking on it and my husband is already trying to see how we can incorporate one at our home! Bedroom very comfortable and a/c worked great. We did not use the living room at all as most of our time was spent outside. Thanks again for everything and we will be back!" "When our greeter opened the door of Coconuts, our mouths dropped open. The view was so spectacular. Even more beautiful than the photos. Everything we could ask for was in the home. We spent the first night there making dinner on the Tappanyaki and grill and watching the sunset from the hot tub. Than a great game of pool. Each morning we would sit in the outdoor table and plan our day of snorkeling. We brought our own equipment, but they have everything you need if you didn't . We did borrow the boogie boards and they were fun. The bedrooms are so nice, the loft bedroom has the bathroom downstairs, so that would be better for someone younger. We spent most of the time outdoors, but one night we watched a movie (they have a large list of DVDs) on their projector which was like being at the movies. So nice! The owners have supplied a book which lists just about everything you could need, also places to eat and snorkel, ect. Coconuts is clean and well-cared for and has every amenity. It was like heaven and we are definitely going to go back. My friends saw the pictures on Facebook, and now they all want to go! Thanks to the owners for sharing their little slice of heaven with us. We really loved it!" "Plumeria was just as pictured. Beautiful property. We loved being up on the hill. The views from the deck were amazing. Truly gorgeous. We really enjoyed the pool and hot tub when we weren't at the beaches. The location of the home was great. Not too far away from anything on St. John. Kevin and Danielle were great hosts throughout the trip and offered many helpful recommendations for things to do on and off the island. We will definitely be returning." "My family and I just had the most wonderful week at Plumeria. Here are notes: The view is ridiculous. 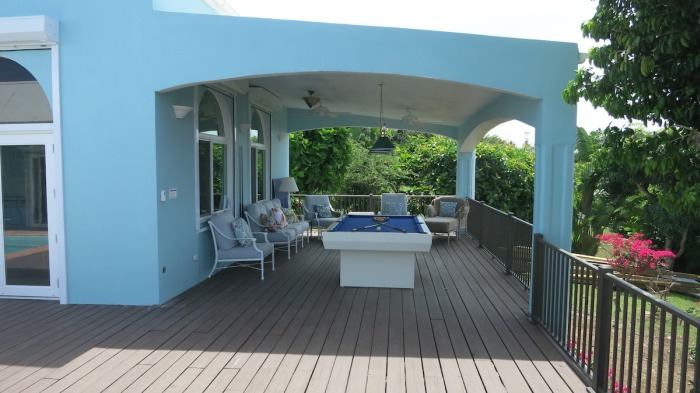 Our favorite part of the house was the huge outdoor living space (deck, pool, hot tub, porch, and dining area), which made it easy to enjoy the view all day and night. It looks just like the pictures. The house is spacious, beachy, clean, and very comfortable, and was stocked with everything we needed to have a very easy vacation. 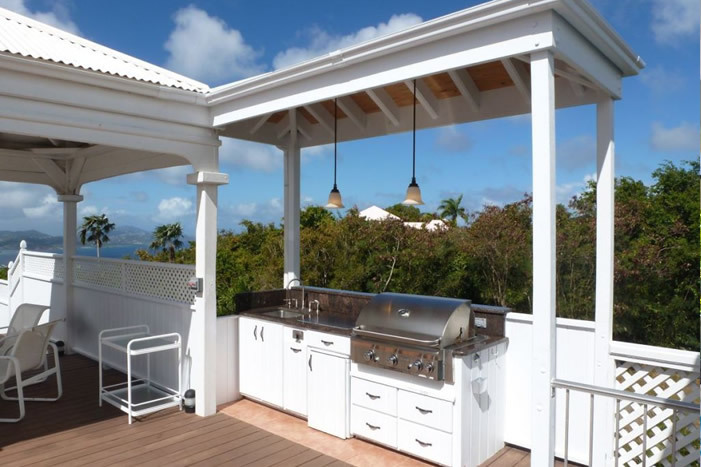 The homeowners left all kinds of detailed information about the house (how to use every remote; how to use the outdoor cooktop and grill) and the island (descriptions of beaches, trails and restaurants). We had no questions, and everything was a piece of cake. Beach towels, various sizes of snorkel gear, beach chairs and coolers are all provided. We packed three empty beach bags and fins for the two of us that had them; otherwise, we used what was at the house. The house was easy to get to and only about a 10 - 15 minute drive into Cruz Bay. We loved Plumeria, and all of us (family of four) cannot wait to make a return trip." "We just finished a week at Plumeria and it was everything we dreamed of. The place looks exactly like the pictures but the views are even better! We watched some incredible sunsets from the deck. It was such a relaxing week. The layout of everything is perfect, it is nice to have the bedroom separate from the living area. And the deck is huge, there was so much room to spread out! We enjoyed the pool and the hot tub everyday. We hiked Rams Head Trail which was amazing, it was fun to see the other side of the island. Cruz Bay is only about a 10 minute drive so you are close to all the restaurants. We could not have had a better experience and would definitely stay here again. It really is a little piece of heaven!! The owners responded promptly to any of our questions and the whole trip went smoothly." Amazing home with a spectacular view! "We stayed at Plumeria the week following Thanksgiving, and it couldn't have been more perfect. As first-timers to St. John we didn't know until we got there just how lucky we had gotten with renting Plumeria. The home is perfect, and just as beautiful in person as it looks in the photos. The owners could not have been nicer or more helpful with anything we needed or questions we had, including a mild panic over the not so great weather forecast, which turned out to be not accurate at all (forecast was for rain every day, but we experienced sun every day except for one). The home sits up on a hill and has paved roads and a paved driveway that is not steep at all- a big plus. 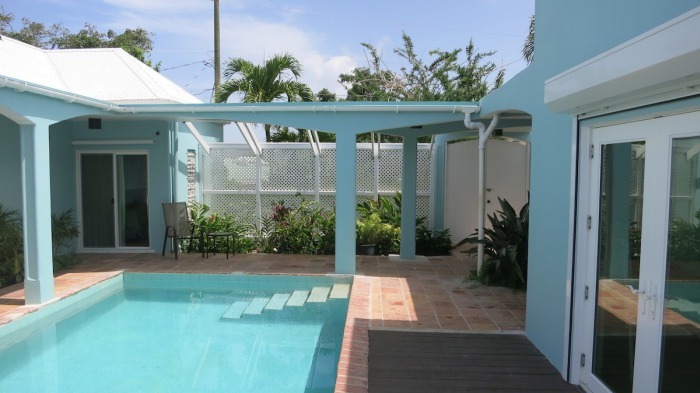 It is in the perfect location of being far enough away from Cruz Bay to be quiet, but close enough that it was very easy to make the trip into town for shopping, restaurants, groceries, etc as often as needed. 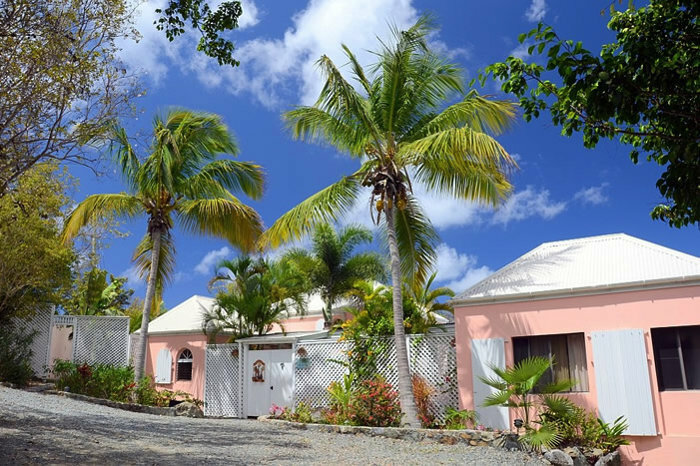 It is also situated so that you can easily drive to the exquisite beaches of St. John, and Plumeria has chairs, beach towels, and snorkeling gear to use. The bedrooms have air conditioning, which was nice to have when sleeping, and the rest of the home stayed very comfortable with fans and so many French doors that open to the lush plantings around the home. We loved seeing the twinkling lights of St. Thomas in the evening. Our whole experience was just perfect, and we would definitely rent this house again!!" 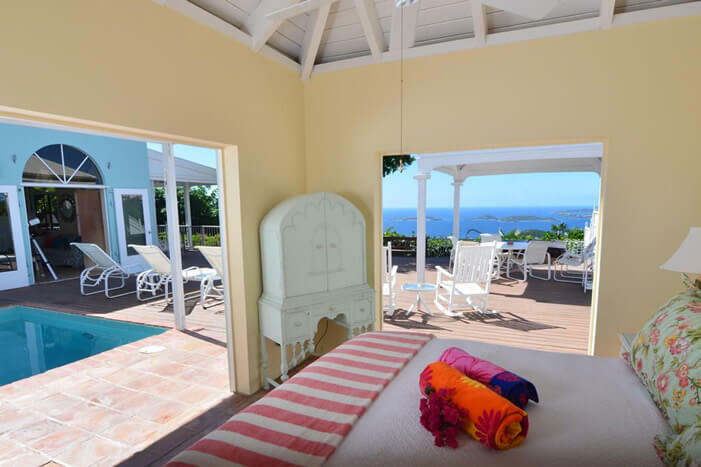 Scroll left and right in the annotated panorama below to see the remarkable ocean views from our villas. This panorama was stitched together from five photos taken on a clear day from Coconuts's lower deck, but the view from Plumeria is essentially the same. Click here to download a copy of the annotated panorama.